When it comes to physical fitness, there are many programs and many choices around, including YMCAs and the big fitness chains. But there are few medically based programs that combine effective training protocols with specialized exercise and professional supervision to help you achieve greater health and fitness in a safe, comfortable, motivational environment. PERK UP! with fitness & wellness options. Personal training: Take advantage of one-on-one attention from an experienced, certified trainer to get all the tools you need to achieve your personal goals. Strength training: We use a variety of methods with and without equipment to help you get stronger and healthier. Circuit training: Sessions deliver a unique combination of strength training and cardiovascular conditioning - and a	fresh way for you to get in shape. Wellness massage: One of the oldest-known methods for relieving pain and promoting improved health and well-being, therapeutic massage is delivered by certified massage	therapists and available for single or multiple sessions. In addition, we offer the unique Aqua Ark program for warm water exercise in a special water tank with an adjustable floor and constant 95-degree temperature. Our fitness and conditioning programs are accessible to our	physical therapy clients who have completed their therapy and want to improve their strength, flexibility, endurance and cardiovascular conditioning. Clients can purchase individual sessions, monthly memberships and annual passes. All sessions are supervised and delivered by certified fitness trainers or massage therapists. 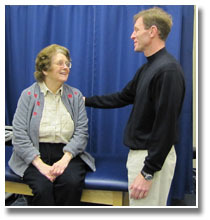 Our staff has decades of	experience working with people of all ages. Personal training and massage therapy sessions start at $30 per 30-minute session. Monthly plans start as low as $35 per month. Annual memberships start at $390 per year. We also offer group and corporate membership programs. Some of these patients develop musculoskeletal problems as a result of their conditions. Often, they have difficulty walking and can suffer fractures or other injuries that could have been prevented with proper training and conditioning. So what would you like to do better? Lose weight? Lose body	fat? Play tennis or golf? Run? Walk? Garden? Participate in a team sport? Enjoy a hobby? Get back to living? Call Physical Therapy & Sports Rehab at 215-679-0105 in	Upper Perk or 215-862-4195 in New Hope to explore the many ways we can help with all your fitness and wellness needs.